High-end brands are always sought after by everyone. We look for discounts and sales in order to get the best deal possible. While some might argue that a high quality jacket should be taken at its price, not everyone can afford to buy the jacket they want. We have looked at some interesting jackets in several of articles, which were alternatives to certain brands’ jackets, at a much cheaper price, of course. 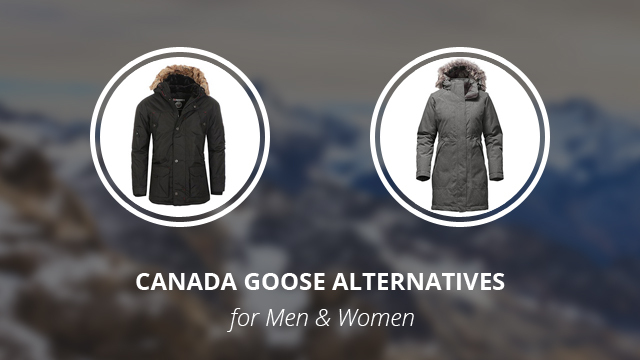 Today we will do the same by going through 7 cheaper alternatives to Canada Goose. Canada Goose is a very well-known company and they manufacture outdoor clothing of incredible quality, which makes it harder to find alternatives that compare to their products’ performance. That didn’t stop us from looking for them, anyway, and we did manage to find some alternatives that you will really enjoy. These are also by well-known brands, but at a more affordable price. This way, you can have more options and make a better decision when purchasing. Below you will find our 7 recommendations. 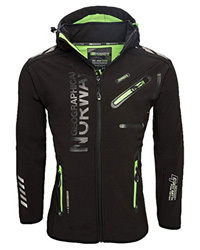 The first jacket is Dubliner by Helly Hansen. This is a men’s parka, made of 100% Polyester throughout. The fabric is HellyTech Protection, the brand’s own deisgn, which comes as a 2ply fabric with both water and windproof protection. To further help with water protection, the seams are all fully sealed and the outer shell has also been DWR-coated. This ensures that no matter the weather, you are safe and dry. Despite being a parka that is suitable for harsh weather, Dubliner is very breathable and also lightweight. 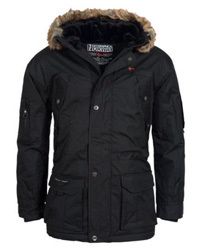 It is insulated with Primaloft Black insulation and comes with an adjustable hood and faux fur trim lining. There are numerous pockets on this jacket and it comes in the colors: Black, Flag red, Navy, Darkest spruce, Graphite blue, Olive night and Rock. Why we think it’s a good alternative to Canada Goose? We think this is a good alternative because of its lightweight, comfortable wear and quality insulation, which closely imitates Down, Canada Goose’s insulation of choice. 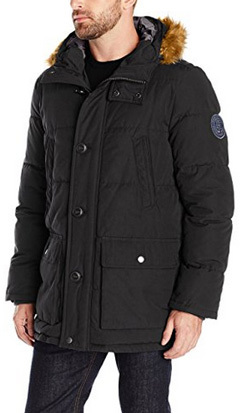 Parker by Geographical Norway is a parka for men that is made of high-quality workmanship. The outer shell is windproof and waterproof, tried and tested. The inside of the jacket is lined with fleece, which helps add an insulating layer and makes this jacket extremely warm. Unlike Dubliner, this is a heavier parka, but you won’t feel it once it’s put on. The hood is adjustable and lined with fleece on the inside, while also having faux fur trim around, which is detachable. This is an adjustable jacket at the waist and hem, too, so you can fit it properly. It comes with numerous inner and outer pockets, which are oversized. The main zipper is covered by a storm placket and the sleeve cuffs are elasticized in order to fit better, while also protecting against the elements. It comes in 3 colors: Black, Black abiosaure and Navy. 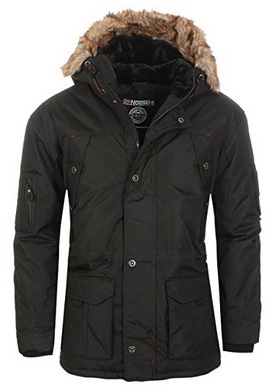 Considering the price, Parker is a parka that provides great warmth and also protection against the elements. It comes in a stylish design and with minimal logos, so it is versatile and can be worn on different occasions. 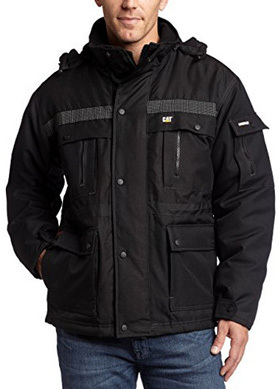 A highly reviewed and beloved jacket, Caterpillar’s Heavy Insulated Parka comes with plenty of pockets, suitable especially for men who work with tools. This is a 100% Polyester Oxford jacket, lined with 100% Polyester Tafetta fabric. It comes with a detachable and adjustable hood, as well as a two-way zipper, covered by a storm placket. It is a windproof fabric, with great insulation to keep the cold out. The outer lining is also very resistant against water. There are adjusting drawstrings inside the hem and waist, so you can adjust the jacket to fit better and also provide better protection. A very neat detail touch is the placement of reflective webbing on the front and back, which keep you safe in dim light and bad weather. There are 3 colors available: Army moss, Black and Graphite. 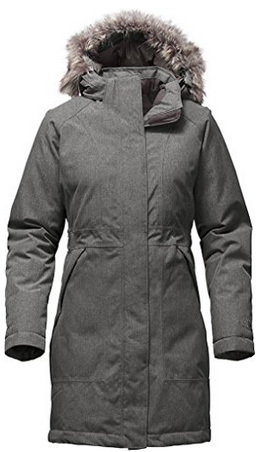 This is a practical jacket that comes with a lot of practical perks, which make it not only a good choice for cold and bad weather, but also very useful in your day-to-day life. Read our review of this jacket here. A longer jacket, Arctic is a quilted snorkel jacket by Tommy Hilfiger. 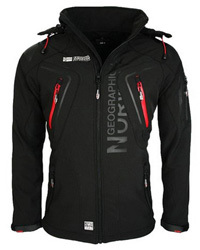 Made of 85% Polyester and 15% Cotton, this is a water and wind resistant jacket, with Ultra Loft insulation. It is quilted to better distribute the insulating filling and comes with four outer pockets and one pocket on the inside. The hooded collar is high and adjustable, lined with faux fur trim around, which is removable. The ribbed storm cuffs help close the jacket off from the elements, while the storm placket on the main zipper protects against wind and rain. This jacket comes in the colors: Black, Dark forest, Heather grey, Heather charcoal, Navy, Burgundy and Dress blue. We recommend this jacket because of its comfortable design and warmth. This is a jacket more suitable for dry weather, making it a good alternative for those who don’t want a heavy and completely waterproof layer. Now moving on to the options for women, the first one is by Regatta, the Fermina jacket. 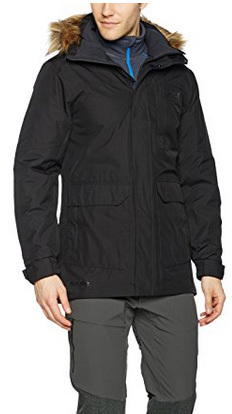 Long and heavily insulated, this jacket is water-repellent and made of 100% Polyester. It comes with Thermo-Guard insulation, which along with the fabric work to trap heat inside the body, while preventing the cold from getting through. The oversized hood and faux fur trim provide great protection against cold winds. There are two hand-warmer pockets on the outside and one security pocket on the inside. It comes in the colors: Black, Navy, Dark khaki and Fig. 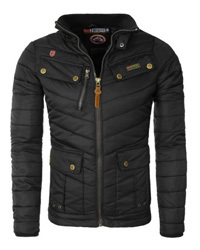 This is a great and versatile jacket, suitable for different weather conditions and temperatures. It is incredibly warm, yet breathable and the length is a great design feature in providing better protection. Another long jacket, Arctic is a parka by The North Face. While not as cheap as the other options for women, this one comes with several key differences, one of which is the 550-fill down insulation. The fabric is entirely Polyester and it is wind and waterproof, with the inner lining being quilted to keep the down distributed better. 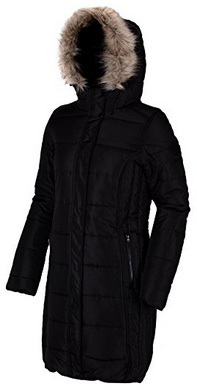 It comes with and adjustable and removable hood, with faux fur trim. The waist is adjustable and the collar provides double protection due to its height and the storm placket. There are two outer pockets and inner ones as well. It comes with a split hem in the back and with 10+ color options, such as: Juniper teal, Urban navy and Vaporous grey. Despite being pricey, it is still a bargain when compared to Canada Goose jackets of the same design, which is the first thing. Secondly, it comes with down insulation and quality faux fur, that help keep both your head and body warm and cozy. Lastly we have Alpinetek’s mid-length parka, which is made of 82% Polyester and 18% Cotton. It comes in a shiny and vibrant Turquoise color and faux fur trim on the hood. This is a puffier jacket as compared to the others, and comes with knitted storm cuffs and a high collar. There are four outer pockets on the body and one on the right sleeve. The fabric is water-repellent and highly durable, making this a long-lasting jacket. Aside from that, it is also insulated with 70% Down feathers. The neck is lined with fleece, which provides plenty of warmth and keeps you much more comfortable. To keep you protected even more, there are 3m scotch lit reflective details. We like this jacket because it is very warm and comfortable, despite being a bit on the heavier side. The design is beautiful and it provides protection in different weather conditions, along with being insulated with down feathers.